It is with great pride and tradition that the National Compadres Network announce the 30th Anniversary of the Círculo de Hombres Retiro which will be held at Mission San Antonio de Padua in Jolon, California. 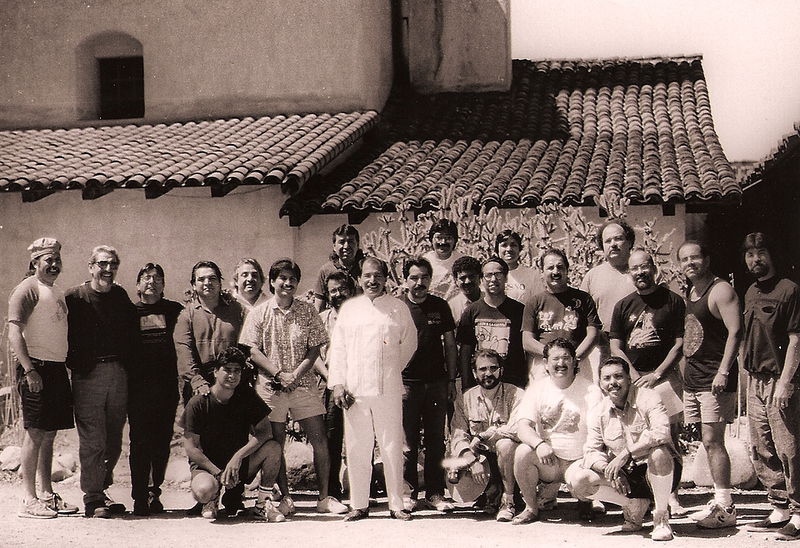 In November of 1988, a group of Chicano, Latino, & Native hombres gathered for three days in Jolon, California in a Círculo de Amistad y Hermanidad. Through discussion, laughter, ceremony and reflection, a very enriching exchange of words, feelings and spiritual energy were exchanged. Their energy was focused on the issues men face that affect them, their familias, and community. The men that gathered at the first retiro did so to rekindle the tradition of gathering in an honorable way and in doing so have reignited the fire that warmed thousands of men during retiros over the past 30 years. As a result of that first gathering, countless local Círculos have taken place across the country. The National Compadres Network was born from the energy of that first retiro and today serves communities throughout the country by illuminating the cultural healing traditions that are often overlooked or disregarded. It is through the teaching of our ancestors and these Círculos that we conduct our work. In the spirit of that first retiro and Círculo tradition we invite you to the 29th Annual Hombres Retiro. In the tradition of the Círculo and because we value our work in retiro, this will be an alcohol and drug-free gathering. We hope to see you there to continue the work of being the hombres that make our familias and community proud. IMPORTANT NOTE: Due to the 30th year Anniversary we expect every weekend to sell out. Slots are first come first serve. Please register as soon as you can to guarantee your place at this momentous occasion. Also note you have three payment options (listed when you press the payment button): credit card, mail in check, or pay at the door. The National Compadres Network is dedicated to the positive involvement of males in the lives of their families, community and society. NCN welcomes any relative that comes in a good way, so anyone having difficulty making the payment in full, please contact Mario Ozuna-Sanchez at mos@compadresnetwork.org to make arrangements for a payment process. Full refunds will only be offered if registrations are canceled 1 week prior to chosen retiro, no exception. NCN is required to provide the Mission of San Padua Jolon an accurate account of attendees, one week before each retiro. Once count is provide NCN is obligated to pay for the slots requested. NCN has continued to build the work of honoring the belief that all people are sacred, by focusing on the affirmation and inclusion of members of our community who identify as being “Lesbian, Gay, Bisexual, Transgender, Queer/Questioning, Transgender, Two Spirit (LGBTQ2S)”. We invite all our relations to the circulo as their full sacred self, however they identify and chose to express that identity.